USB Relay Board is a unique control device that uses a standard USB port. Plug it into your RMS unit or into a Computer. USB Relay Board has five power relays to contol your equipment. USB Relay Board has a Flame Retardant, Medium Impact Resistance, Self Extinguishing ABS plastic case. 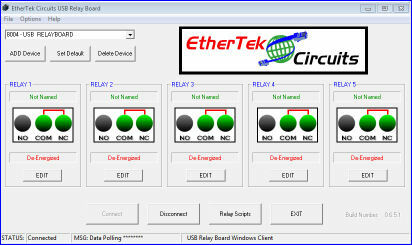 The USB Relay Board has five power relays to control your equipment via USB. The USB Relay Board is a passive control device only, and requires either a PC,SBC, or RMS unit to communicate. Each relay is capable of switching up to 250VAC, 10 Amps or 100VDC, 5 Amps.